With October quickly approaching,Vata Season is upon us. At Back To Bliss, we are attempting to bring the natural Ayurvedic cycles of nature into our programming. With three main phases of the year, we are bringing you programming based on Trimesters, four months to each season. This usually includes and down cycle for the last season and the uprush of new energy for the next season. Vata Season is October through the end of January. Being some of the coldest months of the year, this time of year often leaves us feeling drained and down. On a deeper level our body is transitioning for the wintery weather ahead. Our skin may start to dry out due to the changes in the temperature, humidity or just the additions of the seasonal winds. The dust, mold, and allergens are starting to build in the air and clog pores or respiratory systems. In order to balance with these changes we should add some warm and comforting scents to our routines. Emily has formulated a blend to do just that! Orange, Cypress, Ginger and Ylang Ylang all blend together for a warm and inviting scent that provides energetic balance for the season ahead. Orange is great for fighting depression, a diuretic, and helps to calm nerves. Cypress helps boosts the immune system, helps us to fight respiratory issues, it speeds up wound healing, and soothes skin conditions. Ginger aids in calming digestive issues, it is a great anti-inflammatory, analgesic, and stimulating agent that gets the blood pumping. Ylang ylang will help balance and soothe the warmth of this oil, it’s an aphrodisiac and helps to calm the skin and our soul. Using our Signature Scent in a massage oil and regularly getting massages during the whole season can help you better transition from the heat of summer to the cold of fall. It will help you to dispell the gloom on your spirit that often comes with a decrease in daylight and a restriction to the activities of summer. Our Signature Scent for this Vata Season has been added to several products. These products have been created to help complete your wellness routine and focus it for this seasons stresses. To start your day: Dry brush in the direction of the lymph nodes (toward the heart or watch the video), Shower and use 2 Tbsp of Signature Scent oil after showering and rinse off or blot dry. Allow oil to soak in before dressing. Enjoy services and participate in our soulful nurturing workshops designed to inspire, pamper and renew you! Begin the day by waking up your Chi to get your artistic juices flowing. Our paint away workshop is a blast! The lovely bridge over flowing water with a fall scene represents change, transition, choice, and movement in your life. What better theme for spring! Finish the day with a beauty workshop with Jess M. and create and take home some wonderful bath ritual products that you can use after you get home to complete your day of renewal. Attend each event individually or stay all day for one low fee of $60. In Spring Forest Qigong, Carrie will show you how to get the energy flowing in standing and sitting positions. 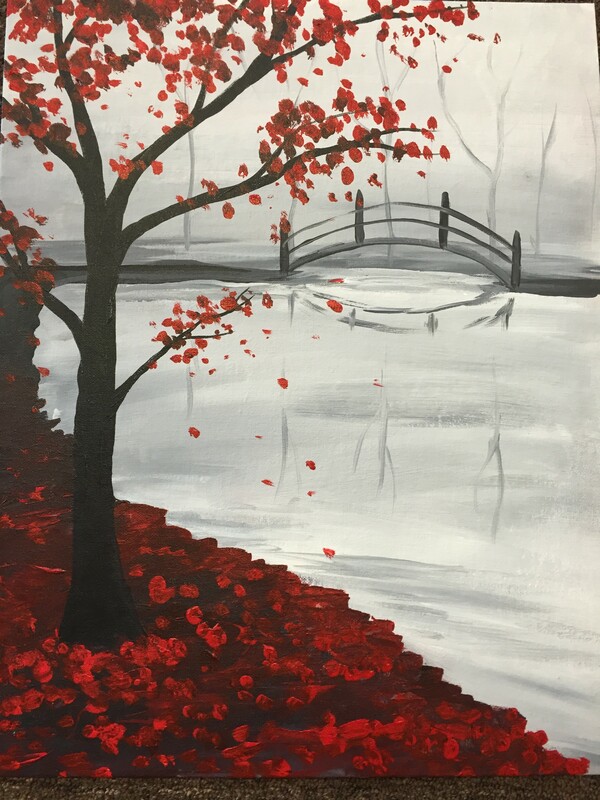 Paint Away’s Kimi and Roxie will show us how to paint this picture in a creative fun way, while bonding with family and friends. All ages welcome. Kids under 15 can choose a smaller canvas. Join Jessica M for a few new fun Spring/Summer looks with Jayne Iredale makeup. Come and experience all four classes for $60! A light snack will be provided for anyone attending. Click on this link to our Soulful Beauty Event to open a savable and emailable PDF. Feel free to print and take the flyer to work or share this post below with your friends to invite them and spread the word. Scents are used as wellness therapy all over the world. Why is it that they are so universally acknowledged to have healing properties? One of the answers lies in our anatomy. First, we need to know that a synapse, or a juncture between two nerve cells, is where information can be exchanged. In simple terms, the more synapses you have, the larger the opportunity for assessment, analysis, adjustments, and change. There is a synapse between every nerve cell in the chain of nerves that takes input from our nose to our brain. Normally we think of this opportunity for analysis as being a good thing; we are the mighty champions of the cerebral cortex, you know. The reason that scent is so powerful is because there are very few synapses between the smell receptors in our nose and the end point in our brain. Scent doesn’t have as many opportunities to get diluted, adjusted, and changed. Thus, we can’t diminish its strength or dilute the associations the scent makes with excuses or rationality. Scent goes straight in like a laser. The second reason why our anatomy helps us understand the power of scent comes from understanding what part of the brain the signals are sent to. This area is called the Limbic System. And while it is quite complex, we often think about this area as our emotional brain. Further, the neighborhood where scent signals are processed is also responsible for memory. This physical neighborhood matters because proximity makes opportunity for connections to be made. Our anatomy sets up the opportunity for scent, emotion, and memory to all become closely associated. Everyone has had the experience where they smell something and go, “Wow, that takes me back. Reminds me of…” Those memories and their emotional tones are all tied to the scent. Science is even suggesting that our very ability to smell requires those associative memories. That’s how profound the connections are. We can use scents to trigger specific emotions and to balance them. But, because of scent’s association to specific memories, we can also bring out happy associations to brighten our day or pull up negative memories for processing. The science of using scent for wellness is called Aromatherapy. There are a tremendous number of different Aromatherapy Essential Oils to choose from. The individual scents each have different balancing effects on our emotions. I highly recommend doing a little research on this wonderful healing modality. Hopefully this article helps you appreciate why scent can be so helpful. Next week we will give examples of specific Essential Oils and their healing properties. Caution: Aromatherapy Essential Oils are not just used for their scent. This can be confusing when looking at the uses of essential oils. The extractions pull more than just the aromatic plant compounds out. This gives the entire modality of Aromatherapy a broader spectrum of use than just smelling them. Remember: Scents go straight into the brain and thus we can’t dilute their effects before they trigger emotional responses. This, combined with the memories associated with them, make them wonderful tools for attaining emotional wellness.